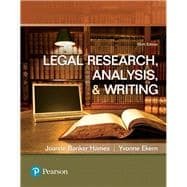 Legal Research, Analysis, and Writing gives students the essential knowledge and tools they need to research and analyze a legal problem and communicate the results in diverse forms of legal memoranda. Covering both traditional and free Internet research, the book’s practical, relevant approach provides a number of outstanding teaching and learning aids, among them short memos with hypothetical factual situations for students to research, research and writing exercises and assignments, writing examples and exercises, online research exercises, citation exercises, numerous sample pages and screenshots, legal research problems with answers, checklists for research and writing, and an Instructor’s Manual. The Sixth Edition updates and expands many of the examples and exercises used throughout the text to give students the latest information available. Joanne Banker Hames is an attorney and paralegal educator who has been actively involved in paralegal education since 1977. She is an instructor in and the former coordinator for the ABA-approved paralegal program at DeAnza Community College in Cupertino, California, as well as an adjunct instructor at Santa Clara University’s School of Law. She earned her JD from Santa Clara University Law School and has been an active member of the California Bar since 1972. As an attorney, she has been involved in research and writing for legal memoranda and appellate briefs. Among the classes she teaches are Legal Research and Writing, Advanced Legal Research and Writing, Advanced Legal Research Using Westlaw and Advanced Legal Research Using Lexis. She is the co-author of Civil Litigation, Introduction to Law, and Constitutional Law: Principles and Practice. Yvonne Ekern is an Associate Clinical Professor of Law at Santa Clara University’s School of Law and a full-time member of the Legal Analysis, Research, and Writing faculty. For seven years she was the chairperson of the West Valley College Paralegal Program (ABA approved). Prior to attending law school, she taught high school English and math in California and Missouri. She graduated from the University of Idaho School of Law in 1985. While working in criminal and family law offices, she taught part-time in several Silicon Valley paralegal programs. Among the classes she teaches are Legal Research and Writing, Advanced Legal Research and Writing, Appellate Advocacy, Advanced Legal Research and Writing Using Lexis, and Legal Analysis. She has over 25 years’ teaching experience. She is the co-author of the texts Introduction to Law, and Constitutional Law: Principles and Practice .